Firstly, a clarification from our last update about full service launderettes being quite expensive for a liveaboard budget - it's not that we're tight, it's just that a kilo of washing equates to 2 bottles of wine, and you do have to get your priorities straight... We currently have about 20 kilos to do... Actually it may be cheaper to do the washing in the wine (white preferably) and then strain it through the coffee filter papers we bought to strain the sloe gin we made in the Vilaine - get yourselves down here Robert & Deborah! 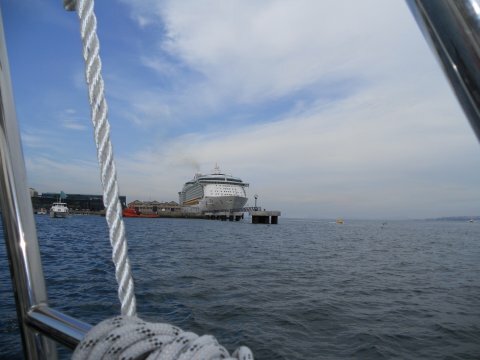 We left Vilanova in the Ria de Arousa on Saturday 13th to sail for the Ria de Pontevedra. We took the passage between the Isla Ons and the mainland and although we had some sunshine, we also had fog patches swirling all around; one minute we could see the mainland beaches and not the islands, the next minute, vice-versa and the wind was fairly light, so we were motor-sailing for a while. There were lots of yachts racing in our intended anchorage between Sanxenxo and Porto Nova and it was a bit exposed in the southerly winds, so we continued up the ria to anchor off the village of Combarro, outside the marina. Once we'd entered the ria, the wind picked up and we had a good sail up the ria with just the genoa set. Sunday was a wet and miserable day so we stayed below, did some chores and wrote the previous website update as well as another article for the BOA magazine. 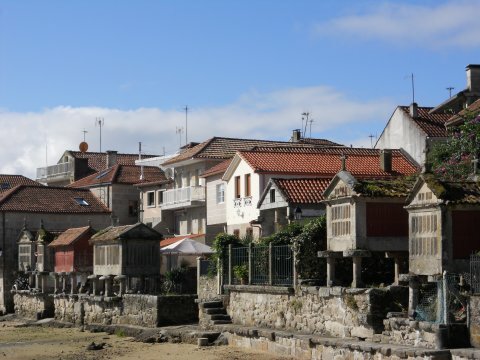 On Monday the Galician sunshine returned, so we went ashore and had a wander through the maze of streets in the old town of Combarro. 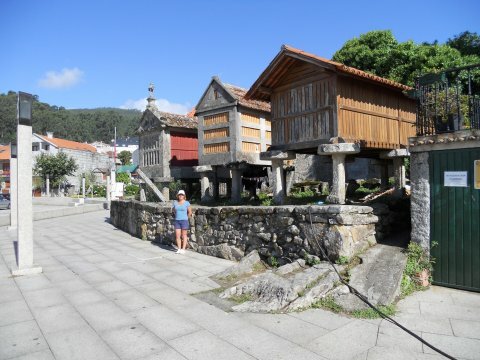 It is a beautifully restored old town with numerous Galician horreos - these are stone and/or timber buildings used to store grain, fish and other produce and are about the size of a single garage, well ventilated and erected on stone pillars (like staddle stones) to prevent vermin from raiding the contents. 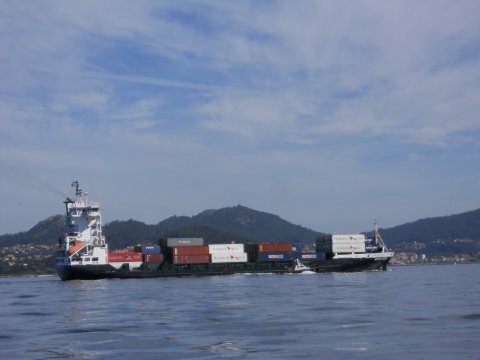 That afternoon, the weather was ideal for the next passage, so we sailed from Combarro to the Ria de Vigo, passing south of the Isla de Ons, where there seemed to be a huge regatta/race going on. We didn't get close enough to get a good photo, but the sight of what seemed like a thousand spinnakers set was a colourful and impressive one. The wind dropped as we passed between the mainland and the Iles de Cies and we had to motor for about half an hour, but then had a perfect early evening sail up the ria to anchor at Moana at 2000. 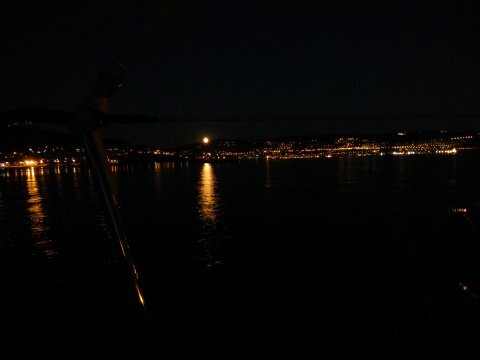 A stunning moonrise and a peaceful night followed after watching fireworks over Vigo. These were the first in Spain we've seen at night (as opposed to during the day) and colour - fireworks as we know them, full colour rather than just a flash, a puff of smoke and a loud bang! 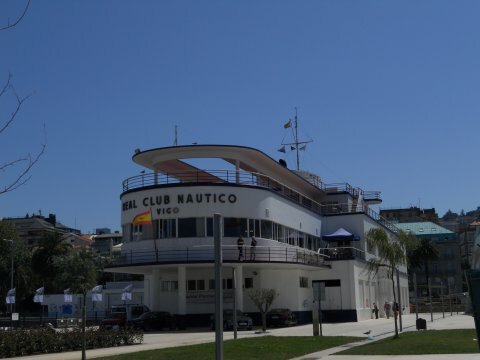 On Tuesday morning, we motored over to the other side of the ria to the Real Club Nautico Vigo where the marina manager is the Cruising Association's HLR. As usual, we entered the marina fully prepared with fenders out and lines on each corner. 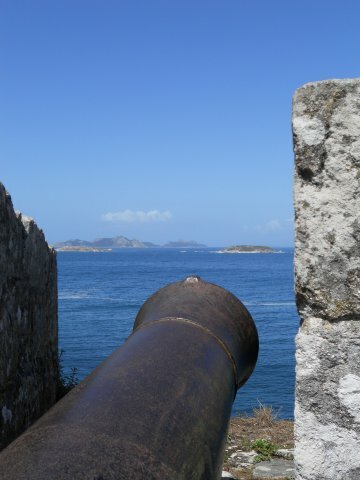 I was trying, in broken Spanish, to ask the marinero who met us in a RIB if we'd be starboard side or port side to, but it soon became apparent that the answer was neither - the berths were stern-to with lazy lines. This wasn't a problem, particularly with the helpful marinero offering assistance, but just a bit of a surprise as it isn't mentioned in the pilot guide or elsewhere. Begona, the marina manager's assistant, is an effervescent whirlwind of helpfulness and efficiency and fluent in at least English and French (and Spanish of course!). In the Club's minibus, she drove us and a French couple to the enormous (and I do mean enormous - we nearly needed the minibus to get around it!) Carrefour at the edge of town and thence to the chandlery. It is true what we'd heard about Begona - nothing is too much trouble, you just need to ask and she's a credit to the Club and the CA. She was apologetic about the 'tired' shoreside facilities but a whole new marina is under construction (the pontoons are already in place) and due to open very soon. 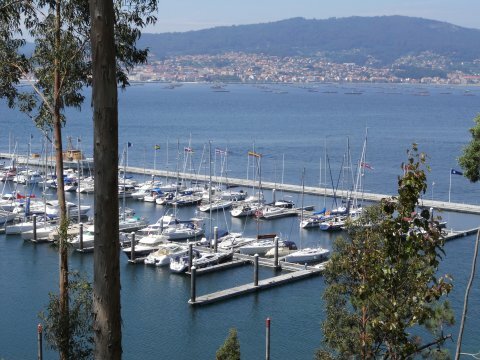 There are plans to replace the facilities in the existing marina (including, Begona hopes, a washing machine as this is a frequent liveaboard request!) The Club building itself looks like a 1930s liner with an art deco interior. Oh, and the beer is cheap and icy cold! The Independence of the Seas visiting Vigo as we left. The marina is in town next to the ferry and trip boat terminals and therefore a bit noisy at times, with the hordes looking over the wall into our cockpit, so on Thursday we made the epic passage of 1.4nm to the marina at Punta Lagoa. The pilot guide said it is reputed to have excellent facilities and on-site restaurant, so we planned to celebrate Andy's birthday there that evening. 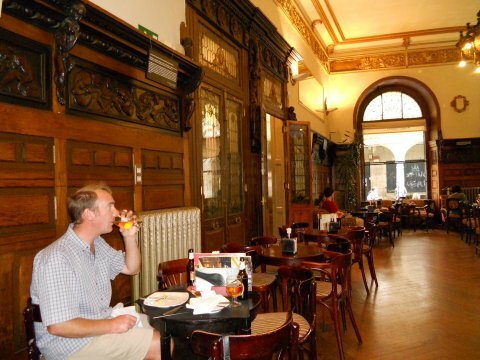 Alas, although the pilot guide was published only this spring, we found the restaurant had closed two years ago and the showers/loos are in Portakabins and less than inviting. 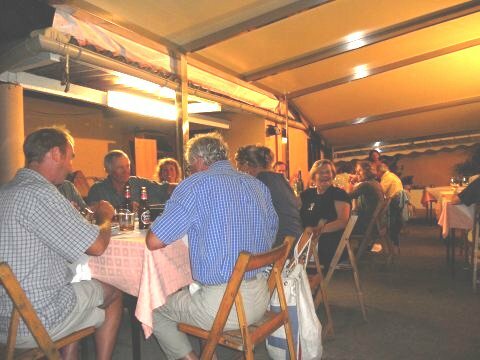 Despite that, it is in a scenic setting nestled below the wooded Monte da Guia with a view of the suspension bridge further up the ria, and the most peaceful marina we have visited for a long time. It is a slightly strange place though, with the large areas of hard standing and surroundings feeling somewhat like a ghost town, yet protected by 24 hour security. 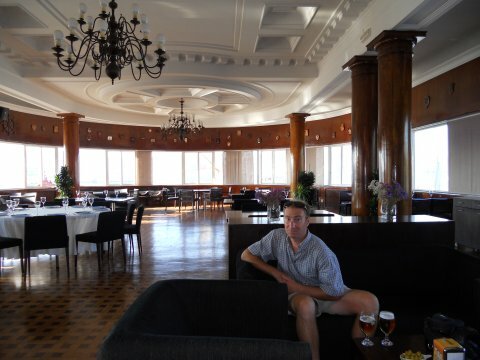 We later found out that the marina doesn't have full planning permission, which may explain why the restaurant (in an attractive wooden building with fabulous views) had to close and the shoreside facilities have not been built. The mixture of eucalypts and conifers around the Monte da Guia makes for shady and scented walking up to the top or around to the beaches. Instead of the aforementioned closed restaurant, we celebrated Andy's birthday in a very rustic (just some tables and chairs in a courtyard) restaurant, Manolos, just up the hill from the marina. 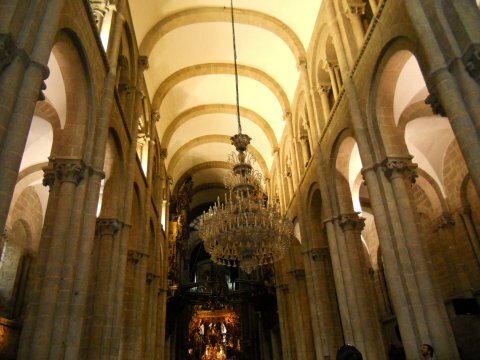 It became quite full, clearly popular with locals, and we seemed to be the only tourists. They have no menu but the owner and his wife let us choose from the selection of seafood in the chiller cabinet. We had deliciously cooked almejas (clams), navajas (razor clams) and grilled sardines, bread, salad and of course a few bottles of wine. A spontaneous and fun night shared with Nick and Helen from Ursa Maris, and from two Dutch boats, Rob from Bold Black Bear and Ilona and Harm from Calluna, all of whom we'd seen in various anchorages or marinas from La Coruna onward. Incidentally, we like the Dutch - all the ones we have met have been friendly, speak impeccable English, have a great sense of humour and like a drink or two... They also seem to have beautiful boats, often steel or aluminium. 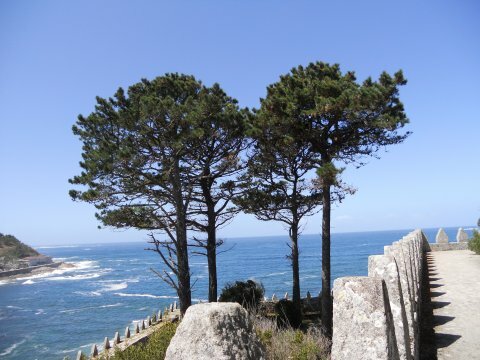 We originally planned to make the short passage down to Baiona on Sunday the 21st, but the forecast indicated potential thunderstorms and for most of the day, there was little or no wind and it was quite muggy. That evening, we watched a quite spectacular natural fireworks display in the form of a massive thunderstorm. For a while there were flashes of sheet lightning every one or two seconds. The thunder and lightning intensified and the rain went from heavy to torrential so we had to periodically spill water that collected in the bimini. The video below was taken before the rain became really heavy, but captures some of the dramatic show. 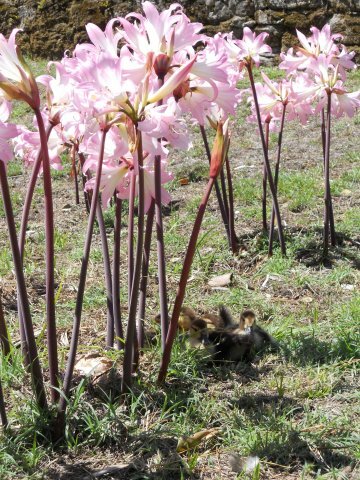 On Monday we awoke to rain and grey skies, so decided to stay put. Video will appear here when we have a better connection to upload it! 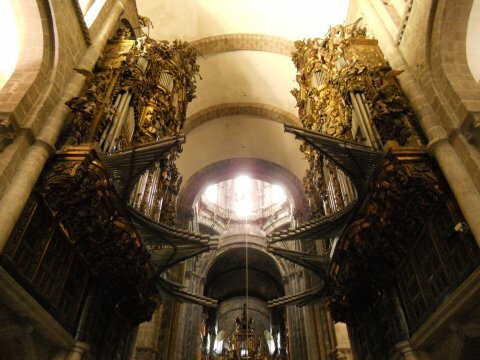 After lunch we ambled through the streets to the Cathedral. 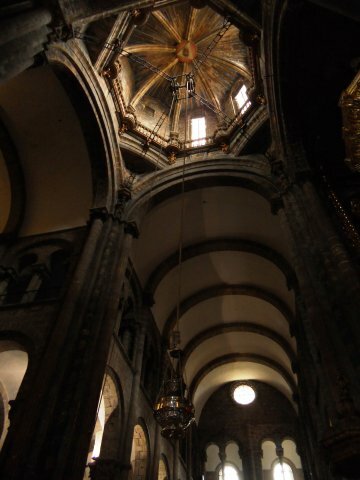 Whatever your religious beliefs or otherwise, there is no denying the impressiveness of the building, and it is thought provoking to contemplate what by now must be the millions of pilgrims who have made their way to Santiago over the centuries. 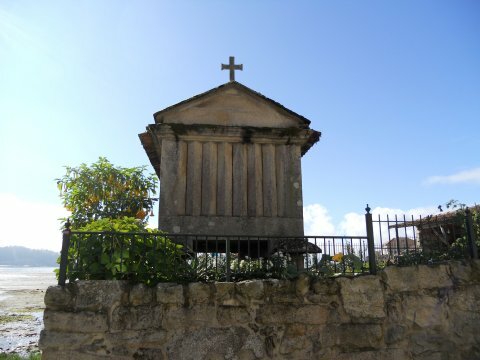 On Wednesday we finally set sail for Baiona. 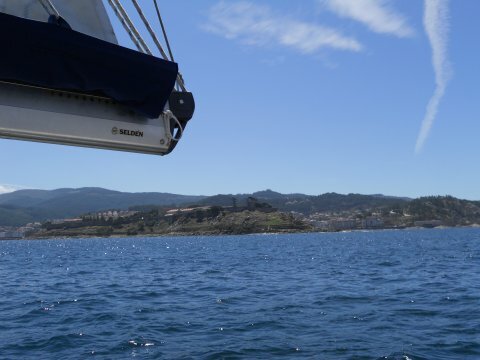 We motored down the ria, but then had a pleasant gentle sail in sunshine round the corner into Baiona and to the Puerto Deportivo Baiona marina. After settling in, we were invited aboard Calluna for a drink and whiled away an amiable few hours with Ilona and Harm. 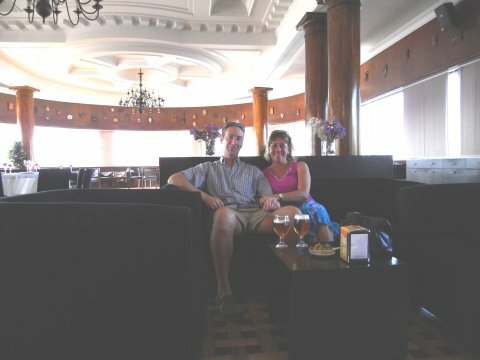 On Thursday we went shopping and attended to some other chores, before walking around the Castillo de Monte Real, with magnificent views out to sea. A pilot boarding a ship bound for Vigo. 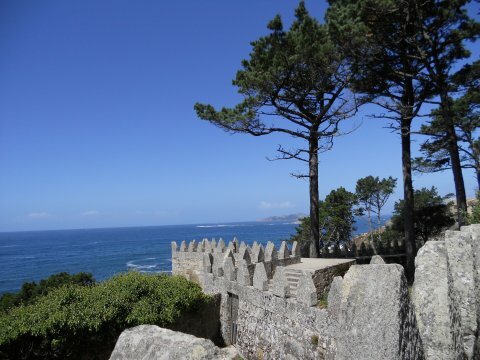 Castillo de Monte Real, Baiona. 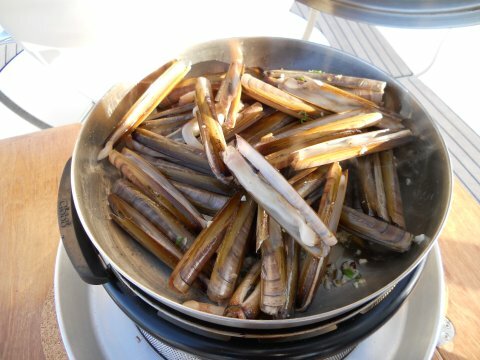 We returned Ilona and Harm's hospitality on Thursday and had another enjoyable evening and on Friday, on our ultimate shopping trip in Northern Spain, we found razor clams for sale! We later moved out to anchor, from where this has been written.